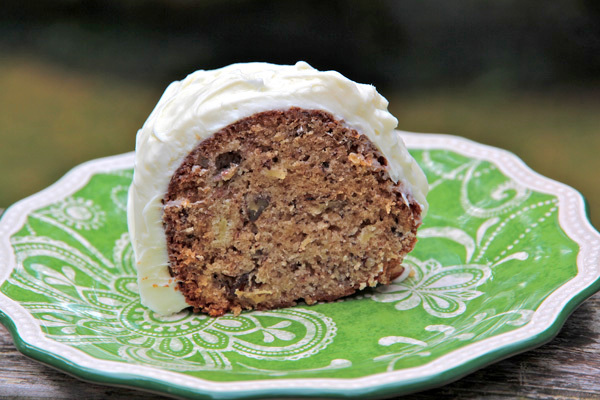 A favorite dessert in the southern United States, this hummingbird cake is loaded with pineapple, nuts and bananas making it moist and flavorful. Baked in a Bundt pan and covered with cream cheese frosting is one way to serve the cake; you can also fill its center with fresh fruit – or do both! But, if you’re the minimalist sort, hummingbird cake is a delight on its own as well. Adapted from The Birthday Cake Book , by Dédé Wilson, Harvard Common Press © 2008. Position rack in center of oven. Preheat the oven to 350°F. 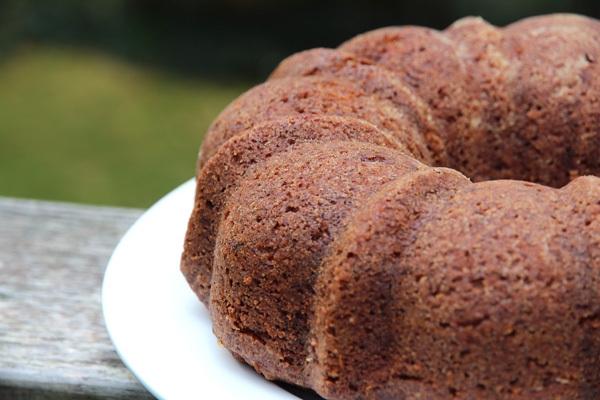 Coat the inside of Bundt pan with nonstick spray, then completely dust with flour, shaking out excess. Whisk together flour, sugar, baking soda, cinnamon and salt in a large bowl to combine and aerate; set aside. Whisk together oil and eggs until well blended in medium bowl. Stir in bananas, nuts, pineapple and vanilla. Pour wet ingredients over dry and stir until combined. Batter will be heavy; make sure you combine well and there are no pockets of flour left. Scrape into prepared pan. Bake for about 1 hour and 5 minutes or until a wooden skewer shows a few moist crumbs. Cool pan on rack until almost completely cooled. Unmold and place directly on rack to cool completely. Cake is ready to fill and frost, if desired. Alternatively, double wrap in plastic wrap; store at room temperature and assemble within 24 hours. Have frosting ready to use. Cover entire cake, top, sides and inside the center with frosting. Make attractive but casual swirls here and there all over the cake with an icing spatula or the back of a spoon. Cake may be served immediately or refrigerated overnight in covered container. Bring to room temperature before serving. If offering with fresh fruit, assemble right before serving. Simply fill center of cake with fruit of choice, making sure there is a generous amount, mounding in the center.